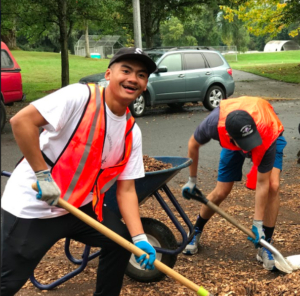 Saturday October 8th, approximately 100 U of P students volunteered through the Pamplin School of Business P4 program by generously donating their time to help maintain and clean up Pier Park. These students removed blackberries branches running along the NAPA Auto Parts area and removed approximately 11 truck loads of blackberries in the process. Other tasks included spreading gravel along the T pads, laying out mulch around the trees, picking up fallen limbs, and removing pinecones from the children play area. Students began arriving at approximately 9am and were finished by 1pm. Tulip Pastries in St Johns was kind of enough to provide them with donuts while Starbucks donated coffee for all these hard workers. (All donuts were eaten by 11am by these hungry college students). The volunteer members on Pier Park’s Executive Board were Vice Chair Kelly Pergande, Treasurer Keola Morely, former technology officer Brian Cole, PPR Allison Parker, and Member Mary Ann Aschenbrenner along with her husband John Aschenbrenner. We greatly appreciate all the hard work from the University of Portland students along with all of our volunteers. We look forward to working with them in the near future.